Some dreams last a long time. And hunchs that have value of prophecies. The traveling musician who helped to introduce the oud into jazz, satisfies his dream of Indian music and invites the famous percussionist Zakir Hussain to share some French stages in duet.The symbiosis is quite obvious but a color is missing : a wind instrument. Dhafer Youssef then summons another "soul mate" : the Turkish clarinet player Hüsnü Şenlendirici. The trio sketches in concert the raw material of "Sounds Of Mirrors". The recording starts in Bombay, then in Istanbul where Eivind Aarset, the aerial jazz guitarist from Norway, joins the adventure. If If the disk was, at the very beginning, a tribute to Zakir Hussain and tablas, it actually takes an unexpected direction. « I felt that, working with and from an indian cultural base, we could approach a more universal speech... This recording was such a perfect ode to friendship and fraternity ! 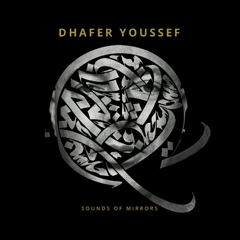 When we played together, I had this feeling that souls were connected, perfectly explaining the title of the album « Sounds Of Mirrors », tells Dhafer. Mixed in the studio Nilento Göteborg (Sweden), the album knows a few moments in weightlessness, during which the musicians seem to stand in the same breath. From the opening sound "Humankind", the head voice of Dhafer Youssef joins the clarinet to become one. Further, with "Ruby Like Wine" and "Like Dust I May Rise", Dhafer still illustrates his talent for establishing a dream atmosphere with a real economy of notes where the heavenly tablecloths of Eivind Aarset are doing wonders. "For me, it’s a more meditative, more spiritual and more accessible record than the previous one, Diwan Of Beauty and Odd". But beware ! Here, looking for a form of deep peace and wisdom has nothing to do with the religious approach ", says Dhafer Youssef. As the work of musical maturity, the voice is set back in favor of a music that spreads, fulfilled. If 5 very contemplative titles can all formed the spine of the disk, the taste of Dhafer Youssef for the groove never fades. In his work, the odd rhythms sound like even pulsations : an irrepressible "drive" certainly gives the desire to go along with the tempo - especially on "Dance Layan Dance" (a wink to his daughter), "Journey in Bergama", "Nasikhabhushani" or on the swinging "Chakkaradaar". The place is left for the precise stamps of Zakir Hussain tablas, conjugated with the free oud of Dhafer. "With age, you do not have to justify yourself musically anymore," he says with a smile.